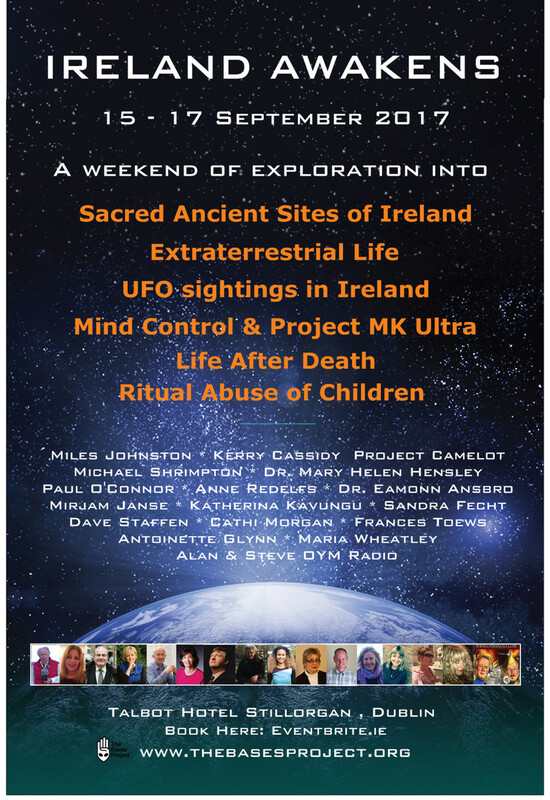 Home \ events \ IRELAND AWAKENS Conference: 15th – 17th Sep.
€119.00 B&B Double or Twin p.n. Please note the rates will be only valid until 4 weeks prior to the conference. After that it will be best available rate at the time of booking. There are 16 speakers and 15 minutes Q&A at the end of every talk. We also offer workshops after the conference. Private tour to ‘Alien Mountain’ and interested areas (Travel by arrangement or use own vehicle). A panel discussion follows Friday’s, Saturday’s and Sunday’s presentations. Please Note: Event Lineup may change due to Unforeseen Circumstances. There is a large car park directly beside the Talbot Hotel for free parking. Yes, you will need to print your e-ticket and bring it to the event. Can I get a discounted rate in Talbot Hotel if I am coming to the event? What is the refund policy if I am unable to attend the conference? Unfortunately tickets cannot be refunded after purchase unless the event will be cancelled. However you can transfer the ticket to another individual of your choice and this person will be eligible to attend the conference. There is no need to notify us about it. Just make sure that the person has the e-ticket as a valid entrance ticket. No refunds will be given in respect of any cancellations or non-attendance. What if something changes to the conference? It may be necessary for reasons beyond our reasonable control to alter the advertised content, timing of the conference or the advertised speakers. We reserve the right to do this at any time. Tickets cannot be refunded in this case. We are also not liable to you for travel, accommodation or other costs and expenses incurred (included wasted costs and expenses) if we are required to cancel or relocate the conference for reasons beyond our reasonable control.